Built after a turbulent time when the city of Barranquilla was hit by cholera epidemic, the townspeople gathered an image of San Roque and prayed for the end of the epidemic. Finally when it ended a church was built on the place to honour the saint in 1881. The church has a very Gothic Florentine to it and has a lot of relics inside. It’s one of the favourite places in the city for congregation of Catholics. 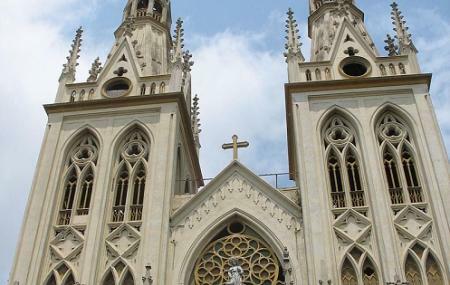 The church of San Roque in Barranquilla is a church under the invocation of San Roque de Montpellier and is built in a neogothic style. The construction of this church began in 1853 and lasted over 5 years. The history behind this church is that during the 1849 outbreak of cholera, gathered an image of San Roque who was considered the patron of the poor. They decorated the place where his image was kept and turned it into a small chapel. With time, peoples’ prayers were heard and the epidemic came to an end. Since then, the native people have been worshiping San Roque. How popular is Iglesia De San Roque? People normally club together Iglesia De San Nicolas De Tolentino and Estacion Montoya while planning their visit to Iglesia De San Roque.